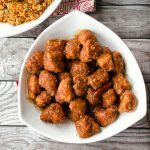 This version of crispy orange chicken involves crunchy chicken pieces drowning in sweet orange sauce that is balanced with the perfect amount of heat from chili peppers. I exaggerate. The chicken isn’t exactly drowning, it’s more of a smothering or heavy-handed drizzle. The perfect descriptive word aside, crispy orange chicken is great. I especially love spicy versions, but when you make orange chicken at home you get to control the heat….so adjust the pepper as you see fit. 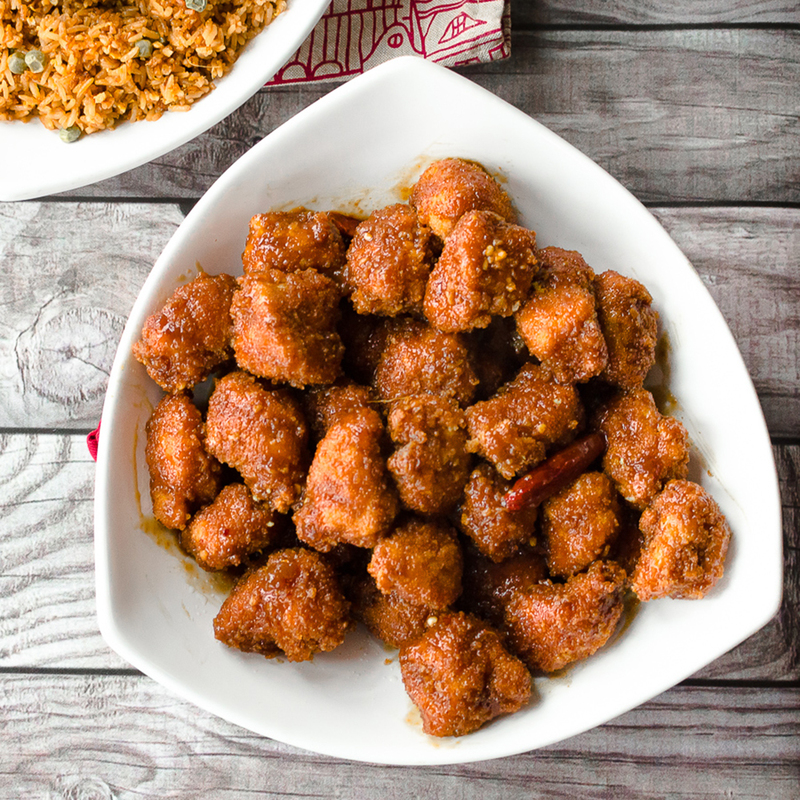 This crispy orange chicken sauce is pretty quick to whip up and keep on hand for busy nights. I haven’t tried freezing it yet since I never have leftovers (we’re a family of seven if you’re a new reader…and my kids are wee piggies when it comes to Asian-inspired food). You could put the sauce in a gallon-sized freezer bag and bring the sauce back to room temperature by placing it on a bowl full of hot water. This would be especially helpful if you decided to skip the chicken frying hassle and pour the sweet orange goodness on top of a bag of popcorn chicken from the grocery store. I’ll admit, that is what I do most nights that I make orange chicken. I like to start with the orange sauce before the chicken since it’s easier to reheat if it gets cold. I get all my prep work done: grating the ginger and zest the orange. I prefer to use chicken tenders and pick them up on sale. Slice each tender into bite-size pieces. Chop each chicken tender into 4-6 pieces. The final step. Toss the chicken in the sauce and serve it! If you have the stamina to continue cooking try the restaurant style Asian fried rice. It’s a nice compliment to this dish. It’s actually one of the top three recipes on Twisted Tastes. Go ahead…take a peek below. Crispy bite-size fried chicken smothered in a sweet and spicy orange sauce. Zest the orange and grate the fresh ginger. Set aside. In a small cup or bowl combine the reserved 3 tablespoons of chicken broth and 2 1/2 tablespoons of cornstarch. Whisk until the cornstarch is completely dissolved in the chicken broth. Set aside. On medium heat in a medium saucepan, add 2 tbsp of sesame oil. After the oil is preheated (about 1-2 minutes) add the minced garlic to the pan and cook for 2-3 minutes or until golden. Immediately pour in the remaining chicken broth and turn the heat up to medium-high. To the saucepan, add the brown sugar, orange zest, grated ginger, onion powder, orange juice, soy sauce, vinegar, and the chili peppers/crushed red pepper. Bring to a low boil. Once the sauce has come to a boil, add to the pan the reserved chicken broth and cornstarch mixture. Allow the sauce to simmer an additional 10 minutes or until the sauce begins to thicken. After the desired sauce consistency has been achieved, remove from heat (slightly gelatinous with a low viscosity) or keep on a very low heat to keep warm while working on the chicken. Continue to stir occasionally if left on low heat. Preheat deep fryer or skillet with frying oil to 350 degrees Fahrenheit (or medium heat). Add to a gallon bag (bag 1), add 1 1/2 cup flour, 1 tsp garlic powder, 1tsp onion powder, 1 tsp salt, and 1 tsp black pepper. Set aside. In a second gallon bag (bag 2) add 1 1/2 cup panko bread crumbs, 1 tsp garlic powder, 1tsp onion powder, 1 tsp salt, and 1 tsp black pepper. Set aside. Beat three eggs and add 1/2 cup of water in a medium bowl. Set aside. Cut the chicken tenders into 1 inch or bite-size pieces if you have not already done so. A few chicken pieces at a time, dredge the chicken into the flour (bag 1). Shake to coat. Next, remove the flour-coated chicken pieces from bag 1 and dredge into the egg mixture. Remove the chicken pieces from the egg mixture and place into bag 2 with the panko breadcrumbs. Shake to coat. Place the coated chicken in the preheated oil and fry for 2-3 minutes or until fully cooked and golden brown. Repeat until all the chicken is cooked. Place the chicken on a paper-towel covered sheet or plate to help remove excess oil. In a large clean bowl add the cooked chicken and orange sauce. Gently coat the chicken. Alternatively, drizzle the sauce on top. Serve with fried rice and broccoli. Try freezing the sauce in a gallon-sized freezer bag and bring the sauce back to room temperature by placing it on a bowl full of hot water and pour on top of a bag of popcorn chicken from the grocery store.